Dishing it up! : Hot Stuff!!!! OK, it's not spicy, but cooking on one of the hottest days of the year probably not all that smart. Went to a delightful graduation party yesterday, and everything was 'ethnic'. Here's my version of something I found to be absolutely delightful. I hope you enjoy. 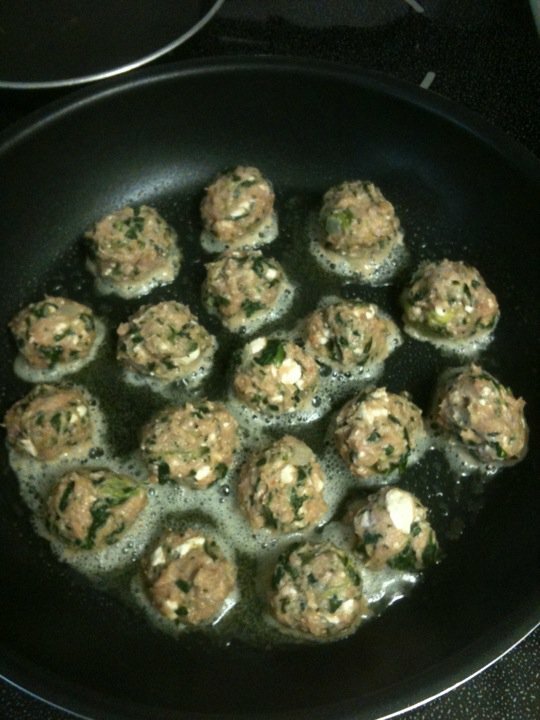 My version of Spanakopita Meatballs. Spanakopita Meatballs - No measuring - eyeball: 18 oz ground turkey (bet it's wonderful w/ground lamb too), frozen chopped spinach, squeezed dry, 1 chopped smallish onion, chopped garlic (can never have too much), 5 oz pkg feta crumbles, Cavendars Greek seasoning. Add as much spinach as the mixture will hold. Spray a large frying pan with Pam. 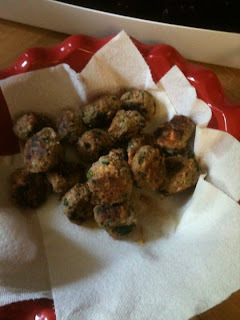 Squish the meat mixture together and shape into walnut sized meatballs. It's not pretty. Pan fry until golden. Sigh with rapture. I made 36 meatballs. These look so incredible! I can almost smell them!